← Memories of dry rock or is it just a dream? Squareface a Cairngorm Classic. Rock climbing this summer – maybe when the sun comes out? 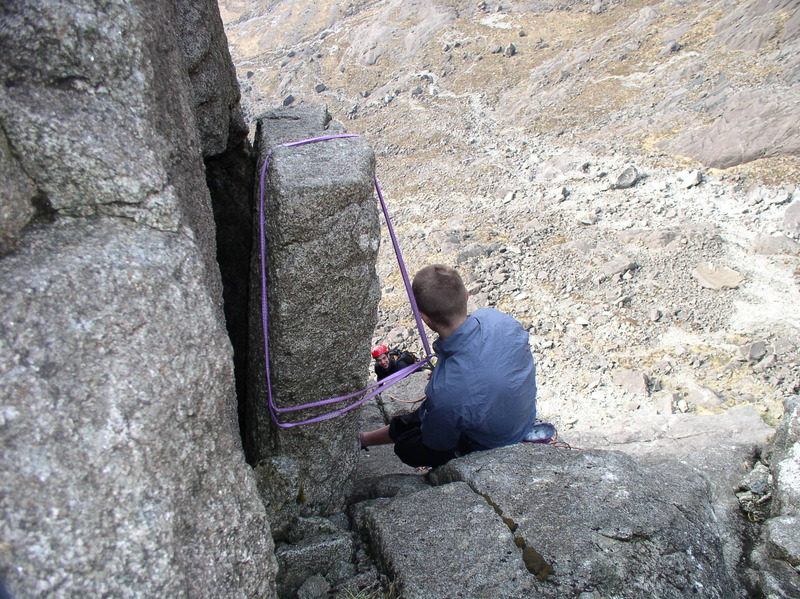 A climber oblivious to a poor belay on Skye! On the route Cioch Grooves. These days there is no excuse for poor belays as the equipment we carry is nowadays so good, thankfully there are fewer accidents nowadays with belay failures. The advent of climbing walls means many climbers learn to climb inside where everything is simple. When you take your skills out in the big mountain routes things change. Always take time over your belay and use at least 2 separate points. Always check even if the belay has been used before is it still a strong belay, I have found on several occasions that what was thought to be a strong belay was a loose rock. There is so much written on the climbing forums and instructional guides it is easy to learn but the best way forward is to get out and climb. The mountain cliffs do not seem so busy maybe it is the weather and or are climbers not so interested in the full mountain experience. It is worth noting that all this rain could produce loose rock, be aware. On this point I would always were a helmet on a mountain route, there is no excuse nowadays as they are all so light and comfortable nowadays, unlike when the photo was taken below in the early 1950’s. Cioch Direct Skye in 1950’s – very basic kit, brave men! This entry was posted in History, Rock Climbing. Bookmark the permalink. 2 Responses to Rock climbing this summer – maybe when the sun comes out? Trust me it was scary to watch and I did mention it as any movement and the sling would have been off. I do not like saying things like that but better than an accident!